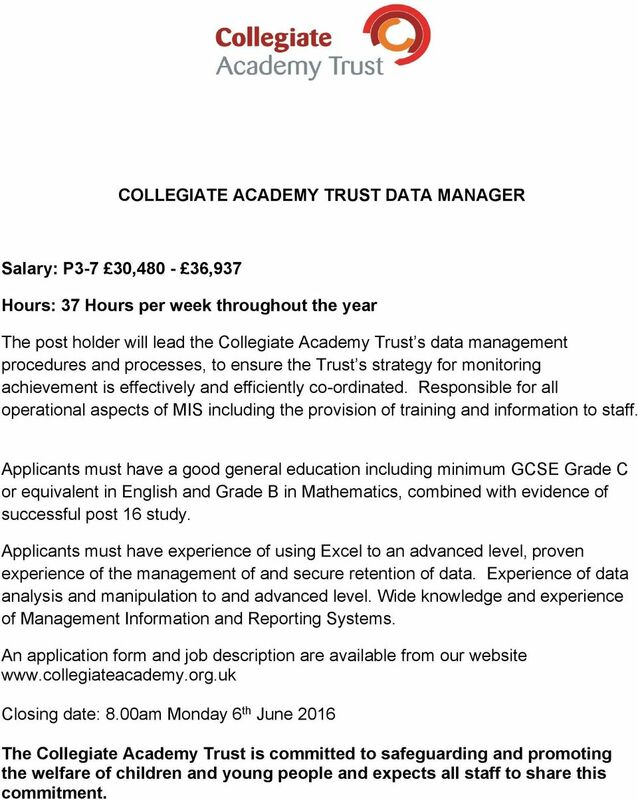 Download "COLLEGIATE ACADEMY TRUST DATA MANAGER"
1 COLLEGIATE ACADEMY TRUST DATA MANAGER Salary: P3-7 30,480-36,937 Hours: 37 Hours per week throughout the year The post holder will lead the Collegiate Academy Trust s data management procedures and processes, to ensure the Trust s strategy for monitoring achievement is effectively and efficiently co-ordinated. Responsible for all operational aspects of MIS including the provision of training and information to staff. Applicants must have a good general education including minimum GCSE Grade C or equivalent in English and Grade B in Mathematics, combined with evidence of successful post 16 study. Applicants must have experience of using Excel to an advanced level, proven experience of the management of and secure retention of data. Experience of data analysis and manipulation to and advanced level. Wide knowledge and experience of Management Information and Reporting Systems. An application form and job description are available from our website Closing date: 8.00am Monday 6 th June 2016 The Collegiate Academy Trust is committed to safeguarding and promoting the welfare of children and young people and expects all staff to share this commitment. 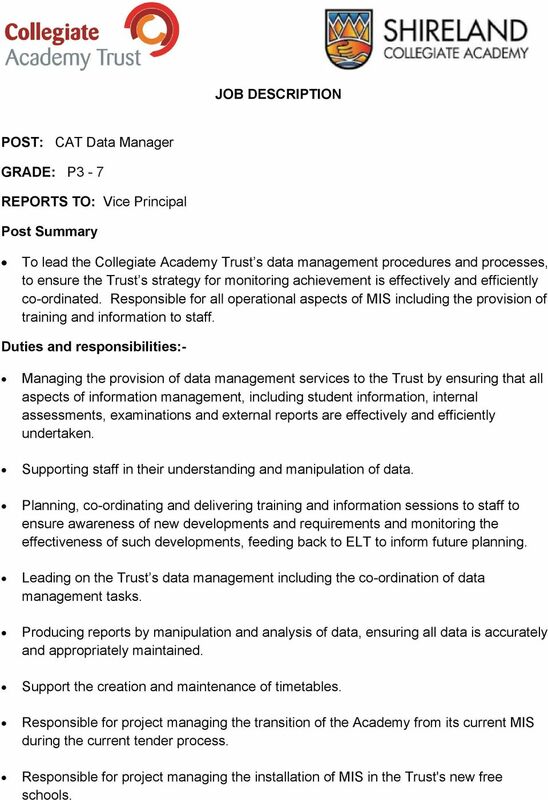 2 JOB DESCRIPTION POST: CAT Data Manager GRADE: P3-7 REPORTS TO: Vice Principal Post Summary To lead the Collegiate Academy Trust s data management procedures and processes, to ensure the Trust s strategy for monitoring achievement is effectively and efficiently co-ordinated. Responsible for all operational aspects of MIS including the provision of training and information to staff. Duties and responsibilities:- Managing the provision of data management services to the Trust by ensuring that all aspects of information management, including student information, internal assessments, examinations and external reports are effectively and efficiently undertaken. Supporting staff in their understanding and manipulation of data. Planning, co-ordinating and delivering training and information sessions to staff to ensure awareness of new developments and requirements and monitoring the effectiveness of such developments, feeding back to ELT to inform future planning. 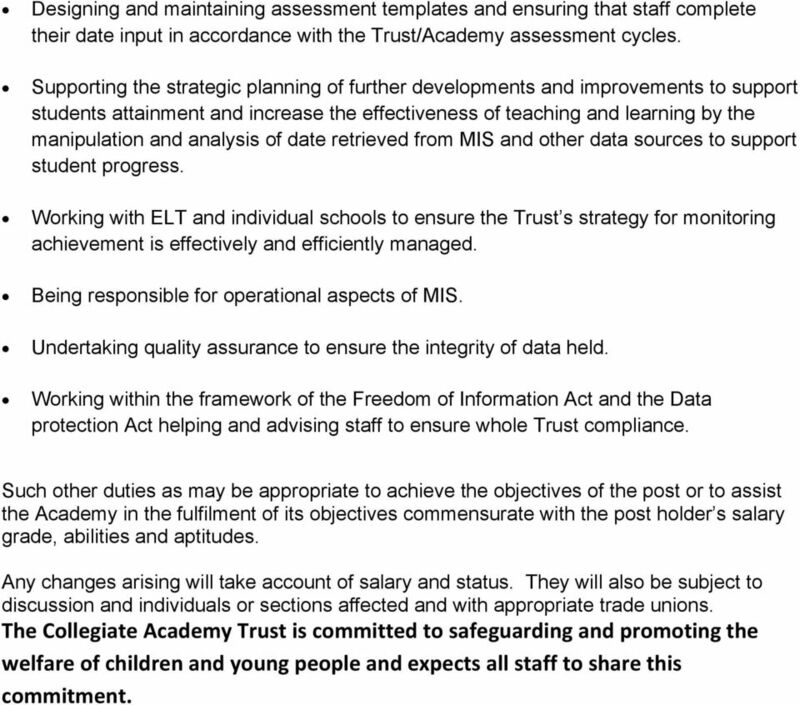 Leading on the Trust s data management including the co-ordination of data management tasks. Producing reports by manipulation and analysis of data, ensuring all data is accurately and appropriately maintained. Support the creation and maintenance of timetables. Responsible for project managing the transition of the Academy from its current MIS during the current tender process. Responsible for project managing the installation of MIS in the Trust's new free schools. 3 Designing and maintaining assessment templates and ensuring that staff complete their date input in accordance with the Trust/Academy assessment cycles. Supporting the strategic planning of further developments and improvements to support students attainment and increase the effectiveness of teaching and learning by the manipulation and analysis of date retrieved from MIS and other data sources to support student progress. Working with ELT and individual schools to ensure the Trust s strategy for monitoring achievement is effectively and efficiently managed. Being responsible for operational aspects of MIS. Undertaking quality assurance to ensure the integrity of data held. Working within the framework of the Freedom of Information Act and the Data protection Act helping and advising staff to ensure whole Trust compliance. Such other duties as may be appropriate to achieve the objectives of the post or to assist the Academy in the fulfilment of its objectives commensurate with the post holder s salary grade, abilities and aptitudes. Any changes arising will take account of salary and status. They will also be subject to discussion and individuals or sections affected and with appropriate trade unions. The Collegiate Academy Trust is committed to safeguarding and promoting the welfare of children and young people and expects all staff to share this commitment. 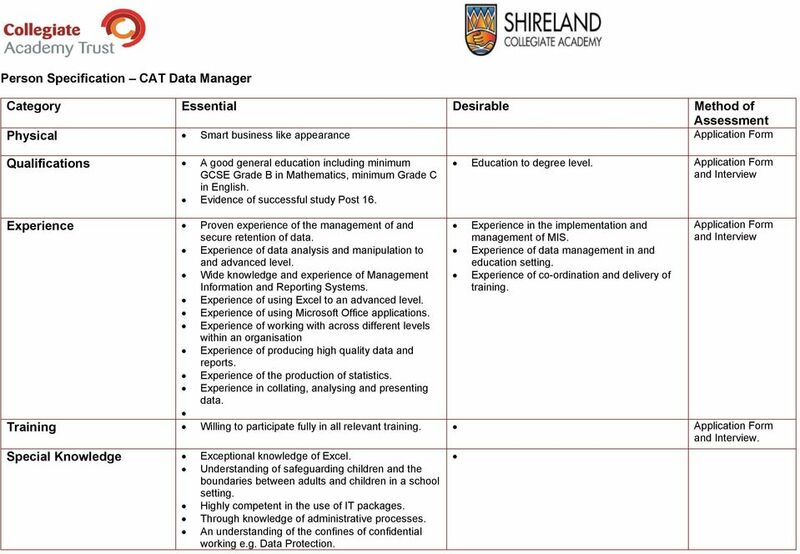 4 Person Specification CAT Data Manager Category Essential Desirable Method of Assessment Physical Smart business like appearance Application Form Qualifications A good general education including minimum GCSE Grade B in Mathematics, minimum Grade C in English. Evidence of successful study Post 16. Education to degree level. Application Form and Interview Experience Proven experience of the management of and secure retention of data. Experience in the implementation and management of MIS. Application Form and Interview Experience of data analysis and manipulation to and advanced level. Experience of data management in and education setting. Wide knowledge and experience of Management Information and Reporting Systems. Experience of co-ordination and delivery of training. Experience of using Excel to an advanced level. Experience of using Microsoft Office applications. Experience of working with across different levels within an organisation Experience of producing high quality data and reports. Experience of the production of statistics. Experience in collating, analysing and presenting data. Training Willing to participate fully in all relevant training. Application Form and Interview. Special Knowledge Exceptional knowledge of Excel. Understanding of safeguarding children and the boundaries between adults and children in a school setting. Highly competent in the use of IT packages. Through knowledge of administrative processes. An understanding of the confines of confidential working e.g. Data Protection. 5 Circumstances Able to work during school holiday periods. Able to attend Academy open and parents evenings where required. Able to work across the Trust including travel to individual schools. Disposition Reliable, organised able to work effectively and innovatively. Flexible and open to change for continuous improvement. Able to remain calm under pressure and manage conflicting demands. To be an excellent team player who effectively contributes to raising attainment and achievement within the Academy. Able to support, influence and motivate others. Practical and Intellectual Skills Ability to interpret or analyse data and information in order to make decisions or recommendations. ICT literate with a desire and ability to develop new skills. Strong attention to detail. Excellent numerical and analytical skills. Excellent oral and written communication skills. Demonstrable ability to produce a good standard of written work, e.g. response to correspondence and reports. High standard of presentation. Ability to exchange varied information with a range of audiences. Ability to use initiative to respond to unexpected problems using recognised procedures and policies as a guide. Good decision maker and negotiator Ability to develop systems and practices which are accurate and efficient. Legal Requirements Enhanced Criminal Records Bureau Check. The post holder may be required to attend conferences and seminars to inform decision making and future strategy. Job Profile. Finance Business Partner Management Accounts. 36 per week in accordance with the Flexible Working Hours Scheme and Agile Culture. Employability and Work Experience Manager. Primary location Easton Campus. (Role covers both campuses) Full Time, Permanent ACE E360. Job Profile & Person Specification Learning mentor Step Up. 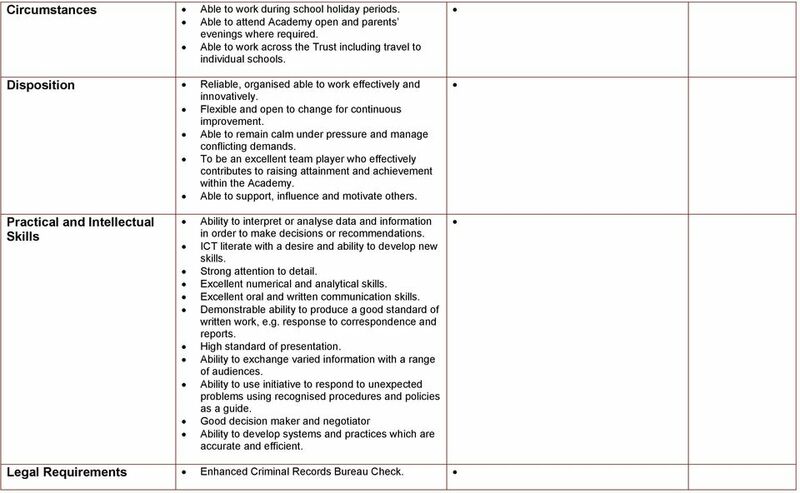 JOB DESCRIPTION Job Title: Responsible to: Hours per week: Grade: Learning Support Facilitator ALS Team Leader Term-time only: 38 weeks / part time (0.5182) Support Scale 5-6 Main Purpose of the Role 1. Role Profile. Job No. (Office Use) Directorate Lifelong Learning Department Services for Children and Young People. JOB DESCRIPTION. 5. ORGANISATION CHART: The post holder will report to the Head of the School of Computer Science, Mathematics & Business Computing.